If you’ve ever ventured to any sort of convention celebrating some aspect of geek culture, then odds are you’ve seen a cosplayer at some point. You know, the folks who take their love for certain characters to the next level by dressing up as them as accurately as possible? In fact, some excel at this craft so well that they’re able to do it professionally, even picking up sponsors and being honored guests at cons. Such is the case with Ani-Mia. Having been on the scene for some time now, this remarkable woman has amassed an impressive social media following due to her amazing prowess of capturing the likenesses of scores of characters from various forms of media. Seriously, I’m not exaggerating – the amount of cosplays she’s racked up is staggering. 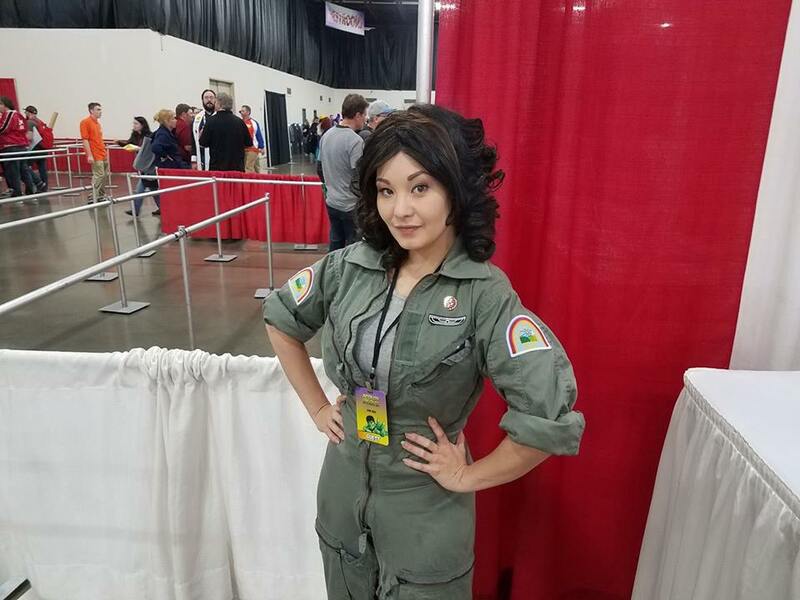 Last week, I was fortunate enough to be able to speak with her at Motor City Comic Con, gaining insight into this realm she’s managed to conquer along with just having a blast chatting geek to geek. Being someone who has recently gotten more serious when it comes to my own cosplays, I can say this opportunity may go down as one of my more memorable experiences of 2017. Check out what she had to say below and enjoy! WGTC: What got you started in cosplay and how long have you been doing it for? And so I bought my first costume, and it was kind of a hot mess. But I still had so much fun that I ended up getting addicted to it, and I’ve been doing it for almost ten years now. WGTC: I was browsing your Facebook gallery recently and noticed it’s like you have a library of cosplays. I don’t know if I’ve ever seen someone with such a diverse set; you’ve covered movies, comics, anime and video games. Do you have a rough estimate of how many cosplays you’ve done to date and are there any that are your particular favorites? Ani-Mia: I have to say that I’ve done over 80 at this point. Zatanna’s always my favorite because everyone loves my Zatanna – I’ve grown to love it as much as they have. But, really, my favorite is Supergirl, mainly because I used to be super shy and there was something about wearing that cosplay. The more I wore it, like, I gained confidence, I became Kryptonian or something, and the next thing I knew, I was confident. So, that’s why I love that one. WGTC: Was there a specific version like Michael Turner’s? Ani-Mia: Yeah, I did the classic… Was it Michael Turner that did the two-piece? Ani-Mia: The all blue, but it was a two-piece. WGTC: Have you liked the TV show so far? Ani-Mia: You know, I’ve watched a little bit of it. I kind of didn’t stick with it, but I watched the first couple episodes and I really liked it. It just didn’t draw me in for some reason. WGTC: I’d say watch season 2 because it felt like they had more freedom when they went over to The CW. I always say to watch the first season, but you can skip ahead. WGTC: Are there any new cosplays that you’re going to roll out soon or are those top secret? Ani-Mia: Well, Sunday I’m wearing Sailor Mars for the first time. Then, I’ve got D.Va that’s gonna be new. I’ve got an armored Rainbow Brite and I’m working on Dark Lily from Legend. WGTC: Obviously, you’re a professional cosplayer. Would you ever work in the film or television industries? Ani-Mia: I’d love to. That’s the thing I grew up on: Film and TV. It’s kind of my world that I’d love to be able to get into again. WGTC: What would be your dream film or television franchise to work on? Ani-Mia: Yeah, I’ll just be Ewok #4 walking around, you know. WGTC: Being a fan of comics, what have been some of your favorite storylines over the years, Supergirl or otherwise? Ani-Mia: You know, I like Flashpoint: Batman [Knight of Vengeance]. It was always one of my favorites just because it was so crazy. I always liked how… I don’t want to give anything away! I liked how the Joker was created. That concludes our interview with Ani-Mia. If you wish to continue keeping up with her work, then be sure to follow her on Facebook, Twitter and Instagram.